Home › Personal Injury › Auto Accidents › What medical treatment should you get? What medical treatment should you get? (1) Doctor Selection: If you are injured, then you should seek treatment from doctors who know how to treat injuries from auto accidents. Sometimes primary care physicians take the position that writing a prescription and waiting 30 days is the best option. Normally, prescriptions and follow up conservative physical therapy or chiropractic is a better approach for someone in intense pain. This avoids the adjuster arguing that you were not really hurt since there was a gap in care. Since our car accident lawyers have handled claims since 1994, we certainly can recommend many doctors to you that we know have a great reputation and that provide excellent treatment. (2) Treatment Plan: The best treatment plan normally involves emergency room treatment when needed, and then follow up conservative treatment (chiropractic or physical therapy). Medical treatment should stop as soon as you are better. However, if you are not better after 6 weeks or so, then a referral to a specialist such as a pain management doctor, a physiatrist, an orthopedic doctor, or a neurologist is often needed. These specialists often will recommend further diagnostic testing to determine why you have not gotten better with the conservative care. 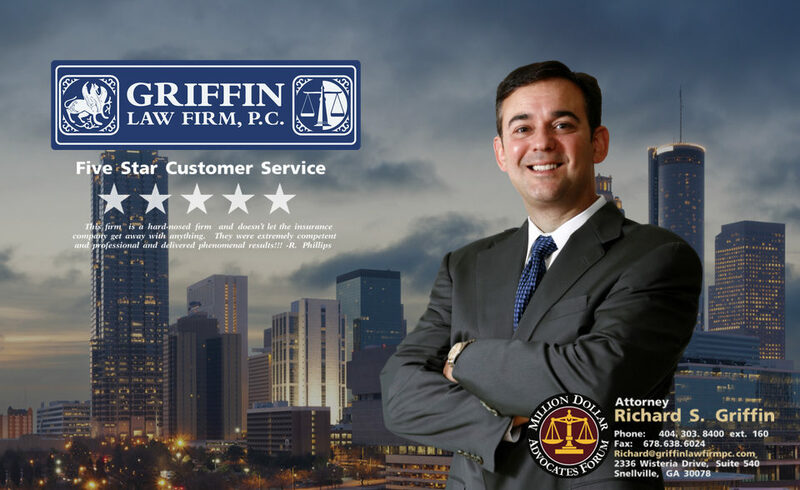 The Atlanta personal injury lawyers at the Griffin Law Firm help their clients make sure they are receive the best possible treatment to get better physically and to properly document their personal injury claim. (3) Diagnostic Testing: Diagnostic testing often involves MRI scans, CT scans, nerve conduction studies, x-rays, and other diagnostic tests that fully evaluate and diagnose the extent of your injuries. Attorney Richard Griffin has represented many personal injury and workers’ compensation clients who at first were diagnosed with soft tissue injuries, but later were diagnosed with more serious injuries such as fractures, herniated discs, ruptured discs, joint injuries, brain injuries, spinal injuries, and other permanent injuries after further testing was done. The settlement value of any personal injury claim rises very quickly when the extent of the injuries is fully documented with objective diagnostic testing results. (4) Use of Health Insurance: Attorney Richard Griffin recommends that you use your health insurance for your medical treatment if you have it so that your medical treatment will be paid for as you receive the treatment. However, if you do not have health insurance or if you cannot afford your co-pays or deductibles, then we can help you get the medical treatment you need on a doctor lien or through the use of medical funding companies. (5) Use of Med Pay: Medical pay coverage is an extra insurance coverage that you may have as a part of your auto insurance or as a part of the insurance coverage for the vehicle you were in at the time of the motor vehicle accident. It is great coverage that allows you to select any doctor of your choice and pays the full cost of your medical treatment as the medical treatment is received without a deductible or co-pay. Med pay coverage is optional and the coverage can be $1,000, $5,000, $10,000, $25,000, or even $50,000 depending on the amount purchased. The car accident lawyers at the Griffin Law Firm have also used med pay coverage to reimburse our clients for their co-pays and deductibles, as well as, to cover health insurance subrogation claims. (6) Use of Doctor Liens: Because our firm has an excellent reputation and has established great relationships with doctors throughout Georgia, there are normally several doctors in your area that will treat you on a doctor lien if we are your attorneys. A doctor lien is an agreement in which the doctor agrees to delay seeking payment for the treatment received in exchange for you agreeing to pay the doctor from your personal injury settlement. (7) Use of Medical Funding Companies: The Griffin Law Firm has an excellent relationship with medical funding companies that will fund your medical treatment, testing, pain management injections, and even surgery when we are your attorney. We have received calls from some potential clients who were calling us because their current attorney was not able to get their surgeries funded. When we can help our clients get the treatment or even surgery they need, then the value of their case increases tremendously. (8) Protect your Credit Rating: Bills from hospitals, radiologists, and ambulance companies often are turned over to collections if you do not pay your bill within 30 days of the date of service. Our auto accident attorneys often can get these medical providers to suspend collection attempts until the case is settle with a letter of protection or a doctor lien. If the medical provider is not willing to suspend collections, then we can help you set up a treatment plan involving small monthly payments to protect your credit rating. (9) Medical Documentation: Our Atlanta personal injury law firm will gather all of the medical records and bills from all of your personal injury related treatment. This is important to make sure that all of your medical damages are included in your settlement demand to the adjuster. Attorney Richard Griffin also requests medical narratives when needed to document causation, impairment ratings, and future medical treatment plans with a cost projection. This allows us to make sure your personal injury settlement includes both past and future medical treatment. (10) Medical Bill Negotiation: The Griffin Law Firm wants to help you with all aspects of your personal injury claim. This means that when needed and appropriate we will even negotiate lower payments to your medical providers. This makes sure that our clients net as much money as possible from their personal injury settlements and verdicts.